The Georgia Bight Shorebird Conservation Initiative was launched in May 2018 to address specific threats to the shorebirds dependent on the southeastern region of the Atlantic Coast. By increasing the involvement of the public, as well as state and federal agencies, we strive to build a local, holistic culture of shorebird conservation to ensure the region continues to provide the resources necessary to sustain shorebirds throughout the year. For many shorebirds our focal geographic area, which encompasses coastal South Carolina, Georgia and northeastern Florida, provides exceptional habitat. This section of the coast is studded with barrier islands and highly dynamic inlets and estuaries that support more than 300,000 shorebirds annually. The unique curved coastline of the Georgia Bight results in large changes of water depth between low tide and high tide every day. This intertidal zone of extensive salt marshes, expansive sand and mud flats, and undisturbed areas of beach creates huge areas of potential food resources that are exposed by the receding tide. In recognition of the value to shorebirds in the Bight, there are three Western Hemisphere Shorebird Reserve Network (WHSRN) sites encompassing much of coastal South Carolina and Georgia. Many of the species that rely on this important landscape are exhibiting population declines. 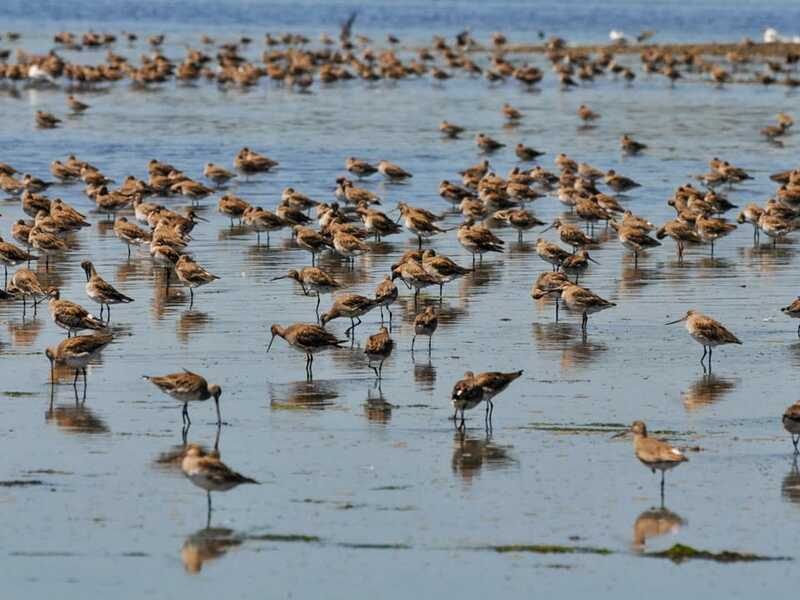 During periods of fall and spring migrations, Canadian and Alaskan nesting shorebirds such as the Short-billed Dowitcher (Limnodromus griseus), Red Knot (Calidris canutus), Semipalmated Plover (Charadrius semipalmatus), and Black-bellied Plover (Pluvialis squatarola) use the region to rest and replenish themselves on the rich, abundant foods. The Georgia Bight is equally important for shorebirds that spend the winter here including the Great Lakes breeding population of the Piping Plover (Charadrius melodus circumcinctus) and the American Oystercatcher (Haematopus palliatus). Breeding birds such as Wilson’s Plovers (Charadrius wilsonia) and American Oystercatchers also rely on the barrier islands, shell rakes and offshore sand bars along the Georgia Bight. Despite the idyllic setting, there are numerous challenges faced by these birds throughout the year that can reduce survival including: human disturbance, disturbance from dogs, loss of habitat due to development, erosion of sand-spit islands from sea level rise, invasive species such as feral hogs, and contaminated sediments from chemicals at some locations. 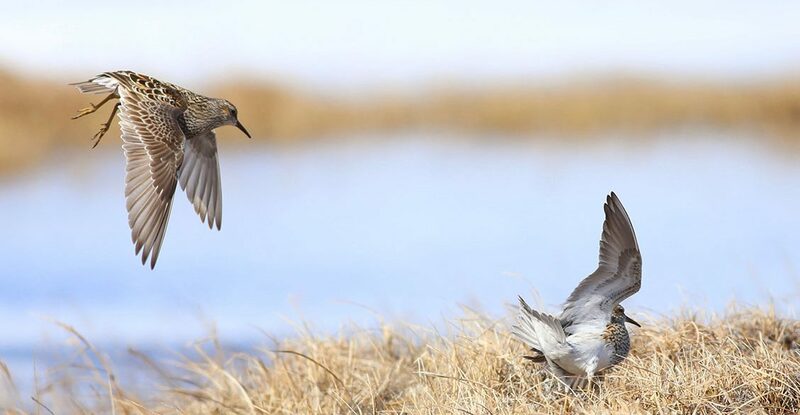 We will work with key partner groups to implement regional priorities of the Atlantic Flyway Shorebird Initiative, the Georgia Shorebird Alliance, and priorities of the Arctic Migratory Bird Initiative through the tri-national Commission on Environmental Cooperation. 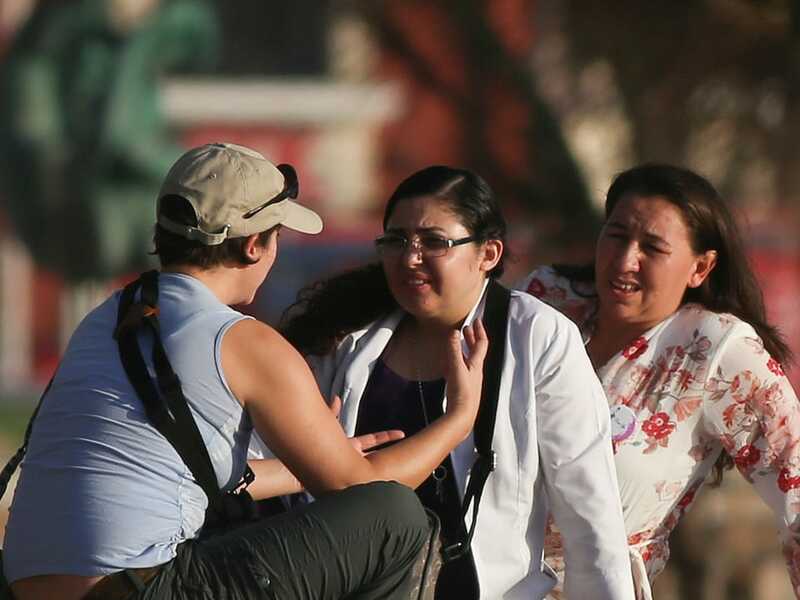 These priorities include, but are not limited to, efforts to reduce human disturbance such as negative impacts from recreation, conflicts with domestic and invasive species, and building awareness through education and outreach. We will build local and regional conservation acumen by engaging the Manomet and WHSRN staff initiatives in research, good governance, capacity building, habitat management, and community engagement. We will also facilitate engagement of the WHSRN site managers with other sites in the Atlantic Flyway that support the same birds. We will conduct research to answer management and conservation questions, promote the International Shorebird Surveys (ISS) for long-term monitoring and population trend analysis, and analyze and publish existing data held by various island authorities that are applicable to conservation actions of the entire coast. We will become a voice for shorebird conservation in the southeast, building upon Manomet’s and WHSRN’s efforts to create a culture and constituency of shorebird conservation at strategic areas, and elevate public appreciation for shorebirds and their habitat through outreach and education channels. Manomet partners with numerous entities such as state and federal authorities (Georgia Department of Natural Resources, South Carolina Department of Natural Resources and Florida Fish and Wildlife Conservation Commission, United States Fish and Wildlife Service, National Park Service), private land owners and managers, coastal municipalities, and nongovernmental organizations (One Hundred Miles, Coastal Conservation League, Audubon etc.) to ensure that the Georgia Bight continues to support healthy shorebird populations. Manomet’s work on the Georgia Bight Conservation Initiative is led by Abby Sterling, Shorebird Biologist, and Brad Winn, Director of Shorebird Habitat Management. Coordinate with existing programs such as the Georgia Sea Turtle Cooperative and the Tybee Beach Ambassadors to reduce disturbance to nesting shorebirds. Facilitate meetings with partners to assess challenges, threats, and resources to create a regional plan for shorebird conservation. 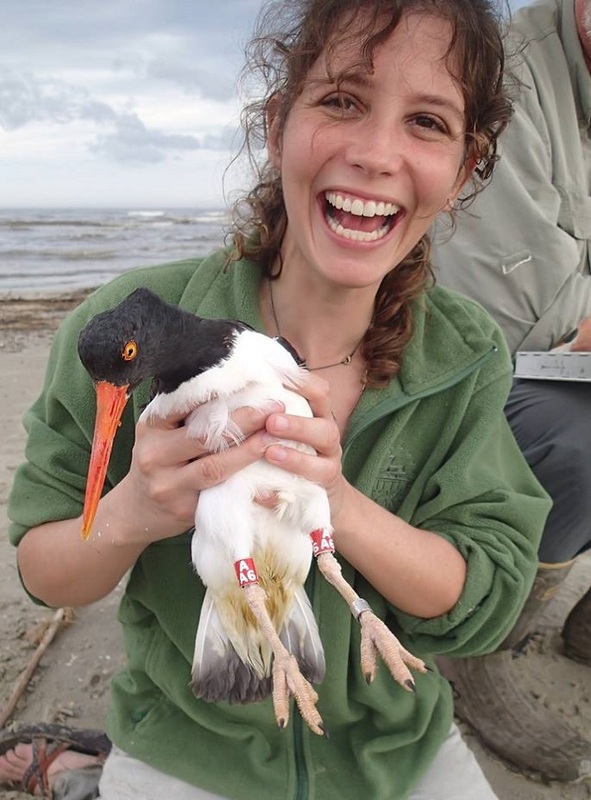 Create outreach tools and build the capacity of the Georgia Shorebird Alliance (GSA). Collaborate with partners in South Carolina to establish a regional entity similar to GSA. Celebrating Georgia’s coast as a landscape for shorebirds and WHSRN’s 100th site!